Chile's Lake District, located in the south of the country between Santiago and Chilean Patagonia, is a spectacular region of glacially formed lakes, snow-capped volcanic mountains and dense forests: one of pristine beauty and picture-perfect scenery. Home to the Mapuche people and more recently to waves of European immigrants in search of a better life, the region is also sprinkled with picturesque towns that have a distinctly European elegance. For three centuries the Mapuche defended their land against the Spanish, but shortly after Chilean Independence they relinquished their territory and settlers flocked to the area, attracted by the rich volcanic soil among lush forests and lakes. Today the area attracts tourists from across the world to marvel at the scenery, climb the volcanoes, hike trails within stunning National Parks and fish beside the tranquil lakes, stopping off at various quaint towns along the way. Temuco is the gateway to the Lake District in the heart of the Mapuche homeland and is still a market town for traditional silver and wood crafts. 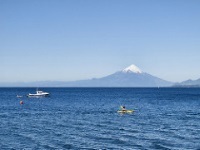 The pretty lakeside resorts of Pucon and Villarica sit at either end of Lake Villarica, dominated by the smouldering Villarica Volcano, and famous as hubs for adventure sports like whitewater rafting. Situated at the meeting of two rivers, Valdivia is an appealing town with its Spanish colonial history and subtle German architecture from the European influx, and also boasts a lively riverside market. Osorno is another town with a strong German influence, particularly evident in its dairy farming and manufacturing culture. It is also the base for exploring one of Chile's most popular national parks, Parque Nacional Puyehue, which offers superb volcanic scenery, abundant wildlife, waterfalls and nature trails. The pastoral landscape, German-style houses and lakeside hamlets are all attributed to the 19th-century immigrants. The capital of the Lake District, Puerto Montt, is the embarkation point for stunning cruises to the fjords of the glacial Chilean coastline and is the gateway to the island of Chiloé and Chilean Patagonia. Its architecture is Middle European consisting of unique wooden designs with predominantly high-pitched roofs and ornate balconies. Many of the older, more traditional houses can be spotted due to their distinct patchwork of weather-resistant shingles, made from the Alcerce Tree. Puerto Montt has a marvellous craft market - a good place to buy handicrafts - and the outstanding seafood is not to be missed. The local cathedral is also well worth a visit, with its large rosary made from fishnet floats above the confessional. Each of the above destinations in the Lake District offers good accommodation, dining and shopping, and opportunities for both sport and relaxation are limitless. It is an enticing region combining outdoor adventure activity with peaceful sunsets and modern amenities. The Lake District gives travellers a taste of the dramatically beautiful Patagonian landscapes on its doorstep but is comparatively easy to get around and offers far more creature comforts than the rugged lands to the south. We are looking for contributors for our Lake District travel guide. If you are a local, a regular traveller to Lake District or a travel professional with time to contribute and answer occasional forum questions, please contact us.